Why Be Curious? So you hear it bandied about: “There are thousands of native grape varieties in Italy!” That’s true, but a lot of them are merely cute. The most serious native variety Timorasso deserves another category (and it’s white to boot). It’s utterly unique, complex, capable of aging, and transparent to where it’s grown. Walter Massa is the contadino straordinario who brought the grape back to life in the early 1980s. He remains the leading producer and go-to grower for Timorasso. Sterpi is one of Massa’s three single-vineyard Timorassos. This site produces more mineral, elegant, and sinewy wines. For Timorasso as a variety: It’s native and unique to the Colli Tortonesi (southeast Piemonte). Before 1980s, most growers were ripping out Timorasso and planting Cortese, as the latter produces more and Gavi was all the rage, so they could sell the grapes easily. Timorasso is one of those grapes (unlike, say, Cortese) that really is delicious and refreshing to eat right off the vine, due to its high sugar content and acidity. When Timorasso is vinified, you get lots of complexity and structure (from alcohol and from tannins – skin contact and thick skins!). Yet there’s plenty of acidity to keep things fresh and a definite counterpoint of what we call ‘honeyed minerality.’ When Timorasso is young, it can be really tight. As it ages, it loses some of its baby fat, and riesling-ish, petrol-like notes emerge. As far as terroir, Walter vinifies each vineyard separately (or tries to if he has enough tanks) and bottles a small portion of three of the vineyards separately. Vigna / Vineyard: From a single southwestern-facing vineyard in the village of Monleale. Loosely-packed stone and chalk soils. Sterpi is local Piemontese dialect for the Italian sterpaglie, “scrubland”. Cantina / Cellar: Native yeasts. Maceration with skins for 60 hours. Fermentation 18-22°C. Batonnage. Light filtration. Minimum six months bottle aging before release. A Tavola… / At the Table… This is not your typically light and simply refreshing Italian aperitivo white wine; it’s one of the great white wines of Italy (really). Like all Timorassos, it’s got substance and structure and deserves substantial food, such as richer fish, poultry, and pork dishes. Use it as you would an Austrian or (dry) Alsatian Riesling. It’s also an excellent vino da meditazione at the end of a meal. Ettari / Hectares: 1.5 hectares. Quota / Altitude: 280 m / 920 ft.
Suoli / Type of soils: Loosely-packed stone and calcareous soils. Esposizione / Exposure: Southwestern exposure. 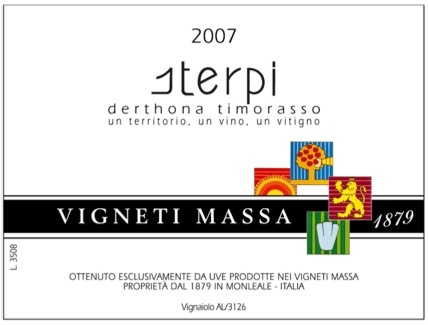 Vitigni / Varieties: 100% Timorasso. Età delle viti / Vine age: Planted in 1996 and 2006. Fermentazione alcolico / Alcoholic fermentation: In stainless steel. Maceration with skins 60 hours. Fermentation 18-22°C. Batonnage. Élevage: In stainless steel and concrete tanks. Minimum six months bottle aging before release. Chiarificazione, filtrazione / Clarification, filtratration: Light filtration (.65 micron). Zolfo / Sulphur: 60 mg/L total, 25 mg/L free. Produzione annua / Annual production: 200 cases.